QA needs to be business driven. Everything we do needs to be business driven. We spend far too much time writing documents that will never be read. We spend far too much time on tasks that don’t bring us close to our goals. Like, pushing to complete test runs before a deadline, only to ignore the results and move on anyway. Don’t do waterfall. Don’t plan the test effort to the last two weeks before you are supposed to go live and ship. Dev will be a little late, then there will be a couple of integration issues and then you end up with three days to do a two week job and in the very end there will be less than zero time to fix any found issues. 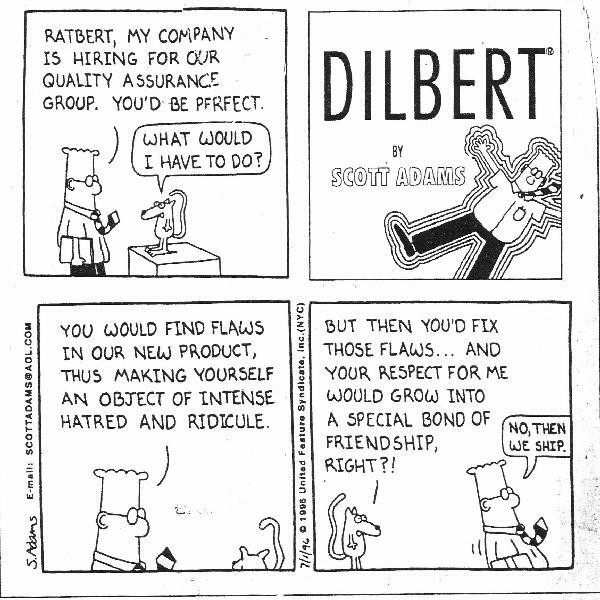 This entry was posted in It's meant to be funny, QA and tagged dilbert, funny, qa by lundstrj. Bookmark the permalink.